MLML lost a giant when Dr. James W. Nybakken passed away on Saturday, June 20. Dr. Nybakken received his doctorate at the University of Wisconsin in 1965 in Marine Invertebrate Zoology and Marine Ecology. 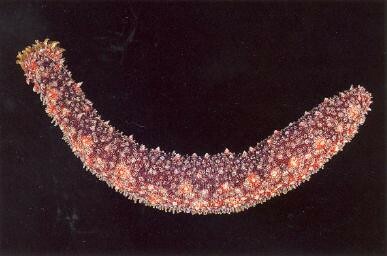 His early work was on intertidal invertebrates in Alaska, the Indian Ocean, and the Gulf of California. 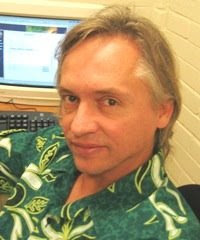 He was first hired to be on the faculty at California State University, Hayward campus. Early in his career at CSU Hayward (now CSU East Bay), Dr. Nybakken and his family moved to Monterey Bay in 1966, where he continued to serve as a CSUH Professor and one of the founding faculty members at Moss Landing Marine Laboratories (MLML) Throughout his tenure at MLML he witnessed the transformation of a small field station cobbled together in an old cannery building to a modern marine institution with an international reputation for excellence in marine science. 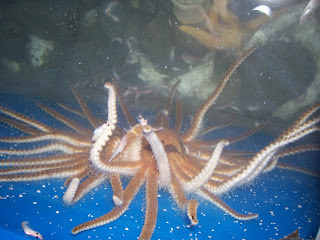 "Giant sea star with an endangered sea-star taxonomist in Japan"
Today..ANOTHER awesome monster starfish from Japan!!! 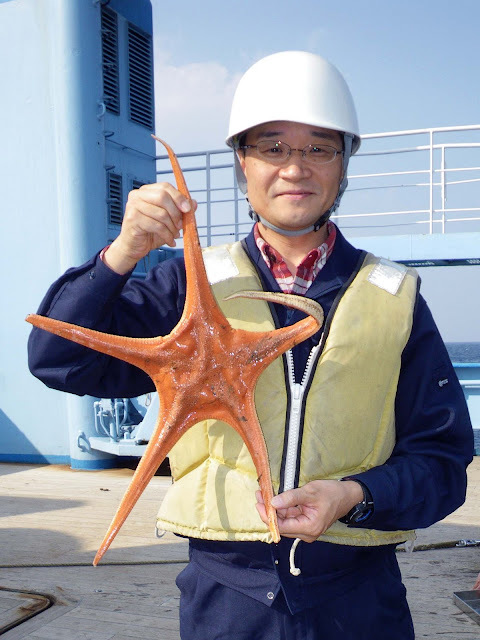 My colleague, Yoichi Kogure at the Japan Sea National Fisheries Research Institue in Niigata Japan just sent me this GREAT pic of him with what is probably the largest starfish in Japan! (and probably a contender for one of the largest in the world). The latin name is Mariaster giganteus described by the famous Japanese starfish taxonomist Seitaru Goto in 1914 and seen only rarely since then! M. giganteus lives in relatively deep-water from the upper continental slopes around Southern Japan. It is a rarely collected species. There have only been maybe two specimens, reported from Japan and I've only seen one specimen from outside Japan. He has provided a caption for the picture which alludes to the ongoing rarity of sea star taxonomists both in Japan and around the world.. Thanks again to Yoichi! A great weekend to everyone! Marthasterias & the classic scallop escape reflex! So, its a busy week "behind the scenes" at the Echinoblog, but that doesn't mean we won't leave you with some starfish on bivalve action! Have a great weekend everyone! Raiders of the Lost "Ark"arua? 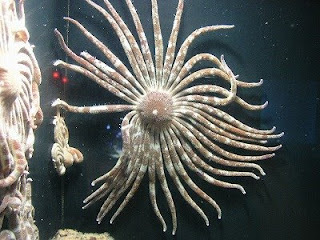 The oldest Echinoderm?? 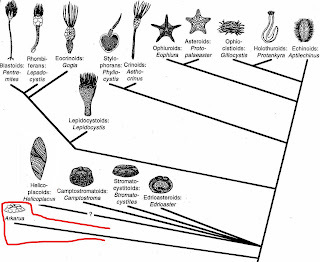 I thought I would shift gears and talk about not only fossil echinoderms..but what might possibly be THE oldest fossil echinoderm!! Details for this are from this paper by J.G. Gehling. In 1987, a new fossil, called Arkarua adami, was described from the famous Precambrian Ediacara beds in the Flinders Range of South Australia (about 635-542 millions of years ago). The absolute age here is important. This fossil is PRECAMBRIAN. Geologically, that's right at the edge of what we think are animals in the fossil record!! Between the absolute geologic age and the fact that these are potentially early animals-its often difficult to "make the call" as to the importance of these fossils relative to more modern forms. Two of these legendary serpents are credited with the formation of what is locally the most prominent landform: Wilpena Pound, a synform after which the Pound Subgroup was named. 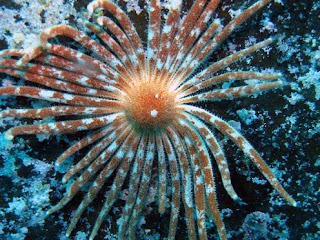 What makes it an echinoderm? 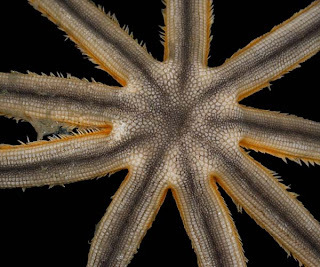 It apparently has pentagonal symmetry (which one finds in echinoderms) with what seem to be ambulacral grooves (where the tube feet emerge) and a distinct marginal rim similar to those in Paleozoic echinoderms called the edrioasteroids. With mouth facing down. They're small. (Only about 3-10 mm in diameter). Here, we have a reconstruction from Gehling's (1987) paper. 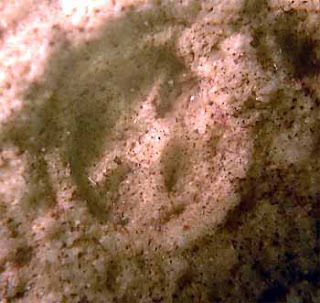 Gehling collected some of these fossils from sediments that showed micro-current scour shadows where flow turbulence eroded a down-current crater. There were apparently two forms that he collected. One that was flattened with a disk-like strongly expressed marginal rim (top) and another that is more convex and looks sort of like a big delicious piroshki (a tasty meat-filled Russian pastry)!! These two may have represented feeding and resting positions of the animal. The big inflated "piroshki" form is the feeding and the disk-like form is the resting position. 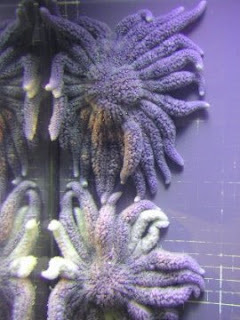 Those are Echinoderms? REALLY? What are they related to? BUT not everyone thinks that these fossils are echinoderms. 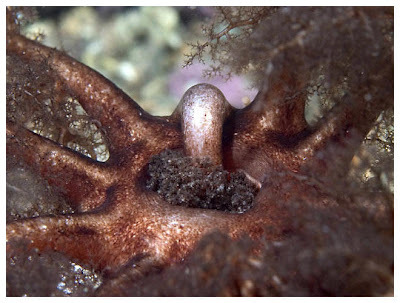 Arkarua is more easily justified as an echinoderm because its pentagonal but this and the related forms have been interpreted as MANY other kinds of animals: sponges, cnidarians, lophophorates and etc..
Sea Cucumber Central! Spotlight on Systema Aspidochirotidae! 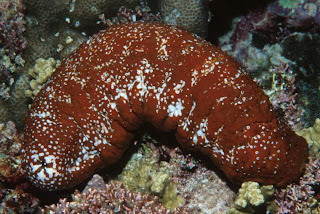 So, the other day, I got a brief email from my colleague Alex Kerr at the University of Guam which led to my examining the big NSF-sponsored Sea Cucumber Systematics Project Website Systema Aspidochirotidae. and the aforementioned Alex Kerr. Go here to see the NSF proposal and summary for the Partnership to Enhance & Expertise in Taxonomy (PEET) and the publications produced. The short summary is that the project aims to clean up the taxonomy and systematics of an ecologically and financially important coral-reef holothurian (=sea cucumber) group via a global coalition of experts from all around the world. 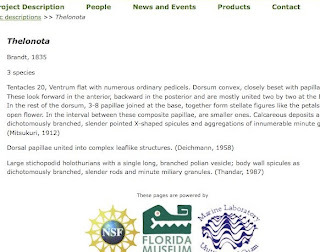 Since the project's initial funding and start in September 2005 (and ongoing) their website has undergone a HUGE development in resources, making it an important resource to anyone interested in tropical holothurians. 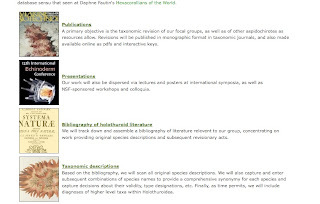 Bibliography This is a HUGELY useful section. 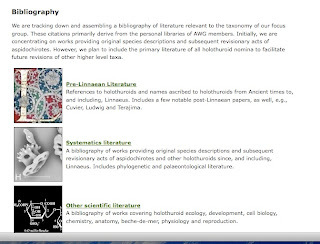 It includes pdf of ancient Pre-Linnean papers and citations for a multitude of literature including biology, cultural references and of course...taxonomy.. But wait! 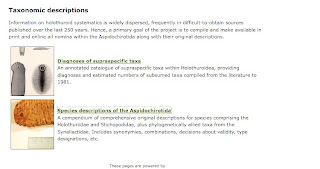 It doesn't just include pdf original species descriptions, it ALSO has taxonomic description compendia of supraspecific taxa (genera and up). 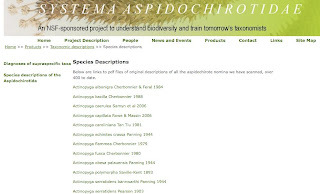 They have over 400 descriptions online with 225 more to be included by the end of summer 2009! Much remains for the group to complete-but clearly, the group has become established as the the global "sea cucumber central" information source! So, I'm running late on World Oceans Day..but its been a busy day..
Today, I bring to your attention a new paper by Erin R. Graham (Saint Joseph's University) and Joseph T. Thompson (Franklin & Marshall College) in the 2009 Journal of Experimental Marine Biology and Ecology-"Deposit-and suspension-feeding sea cucumbers (Echinodermata) ingest plastic fragments". The authors of the study studied four subject species: Holothuria fieldana, H. grisea, Cucumaria frondosa and Thyonella gemmata in the lab and compared these results with data from three different field sites along the Atlantic coast. They used these to study the experimental feeding rates/effects of small plastic bits as they were ingested by sea cucumbers, which are widely ecologically important deposit feeders. The feeding component basically involved artificially seeding an artificial aquarium with plastic shavings and many different kinds of plastic bits-thread, rods, bits, etc. They discovered that sea cucumbers were preferentially ingesting between 2 and 20 fold MORE plastic fragments per individual (per 4 hour interval) then was expected (I gather they assume "expected"= random). Remarkably, one species Cucumaria frondosa ingested 73 times more plastic ribbons then expected! They basically conclude that this was a preference of the individual species. The shapes and sizes were variable factors-but ultimately they strongly influenced the sea cucumbers' predisposition to feeding. The authors complemented their lab work with field studies and found 105 to 214 pieces of plastic per liter of sediment! And MORE important? 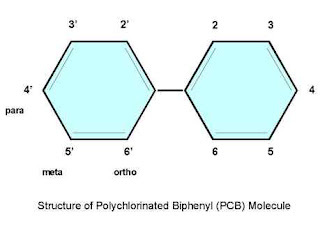 They identified the toxic PCB from one of the more northern localities at a concentration of 0.0106 ug/g suggesting that PCB can be ingested by invertebrates in these soft-sediment communities! ADD to this? 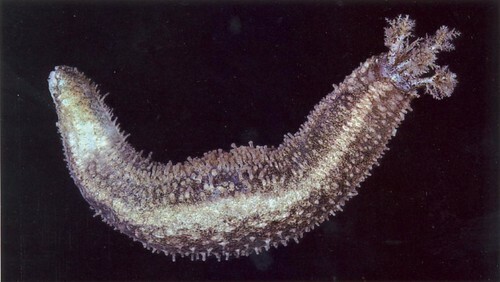 The fact sea cucumbers will PREFERNTIALLY ingest plastic bits over sediment. What the authors didn't have full data on was the magnitude of how much PCBs would be/could be absorbed into the body tissues of individual species. 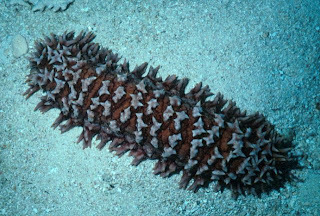 Sea cucumbers preferentially PREFER to ingest plastic bits. 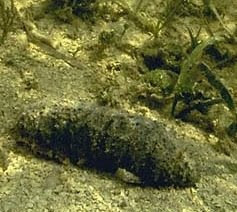 Plastic bits are COMMON in sediment (where sea cucumbers live). 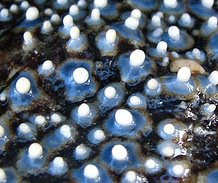 Plastic bits can impart toxic PCBs which are ingested in great quantities by sea cucumbers. 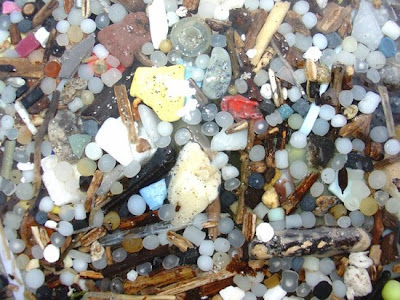 Thus, minute plastic bits can introduce contamination into sediment communities. So, these would be ecologically important on their own-but imagine how important this would be in places where people EAT sea cucumbers! Every so often, I find myself looking over scientific names in latin-and wonder "What the heck does that mean???" -a more general treatment here. 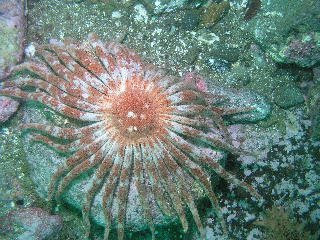 -a specific case addressing deep-sea brisingid starfish here. Understand-sometimes I will have known this name for YEARS without knowing what the actual Latin translates into! And back in the old days, THAT was why the name was given as a Latin descriptor-to make it easy to remember!!! Okay..that makes sense. Luidia, as discussed earlier, is named for Welsh naturalist, Luidius..and so, "senegalensis" ..so basically "from Senegal" which is in Africa? Sounds straightforward, right?? Imagine my surprise-checking the records. This species has been collected from the "American"side of the tropical Atlantic (e.g., Florid,a Jamaica, etc. )..but not from Africa! Oops! So perhaps, an erroneous collection locality record? YIKES! That name's being sitting around since 1816!! And who described it?? None other then famous French Biologist LAMARCK (and later J. Muller & O. Troschel)!! So, now what about this one?? Hey! West coast Marine biology naturalist guys! 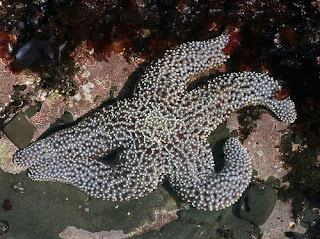 How many of you know what Pisaster ACTUALLY means?? Well...the easy part is "-aster" for star...The first part of that? Is for "pise" for "pea or bean" in reference to all the knobby spines on the surface! That is UNLESS you look at the Holotype! (i.e., the specimen on which the species was described)...its Frakkin' HUGE.. Observe. 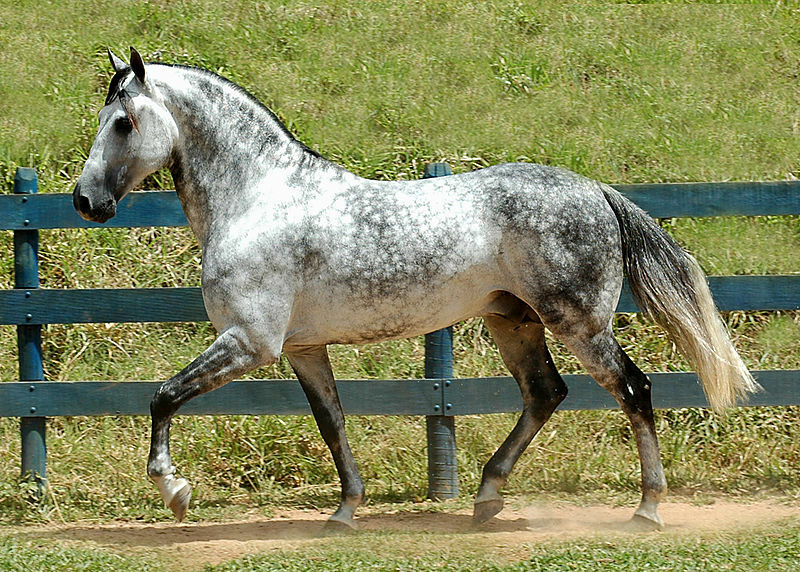 Curiously, the type is also six rayed. A fact, which fortunately did not make its way into the description! Finally....a mystery which I've never quite managed to understand. Some names just DONT' MAKE SENSE. Hippasteria literally means "Horse star" (Hippa for horse and -aster for star). 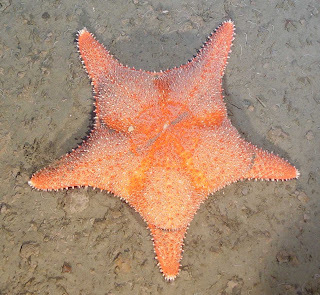 At first, I thought..well, maybe I misunderstood it, so I tracked down the original description from 1840 and lo and behold some of the first species described have names like "Hippasteria equestris" so..."horsy horse star"?? I don't get it. They don't look like horses. They don't have features that look like horses. STARFISH ARE NOT HORSES. So why name it after one? ?